It has been a gorgeous weekend. The weather is perfect and we’re getting loads of fresh air. Though it was on the nippy side yesterday morning it was just warm enough with our winter coats and hats to have breakfast outside downtown. We enjoy walking the dogs down and grabbing a bagel and do some people watching. Yesterday afternoon I started tackling the garden. Today we’ll be bold and plant a few things. We need to thin out the jungle in the house and the brussel sprouts should be fine outside now. 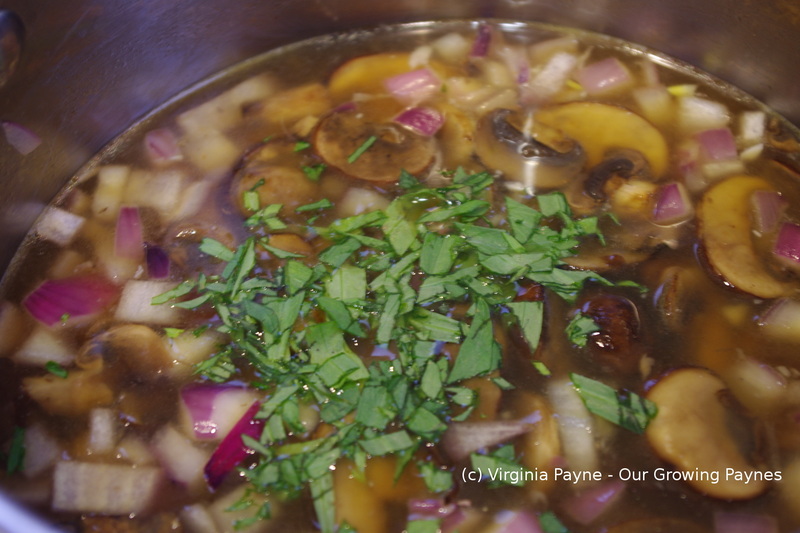 Friday was chilly and I needed to use up some mushrooms so I came up with a mushroom tarragon soup. 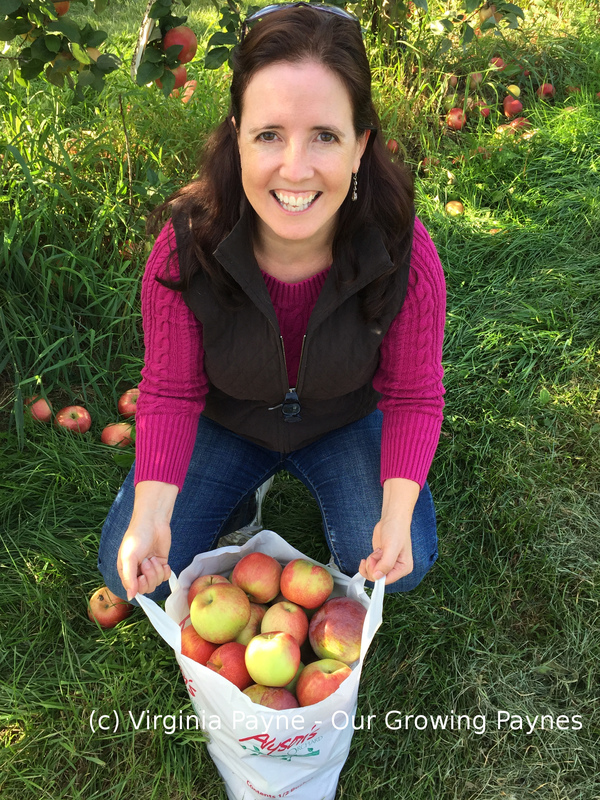 It’s that time of year where you never know what the temperature will be so we can’t shake off the comfort food just yet. This soup has a lot of flavour but isn’t heavy. 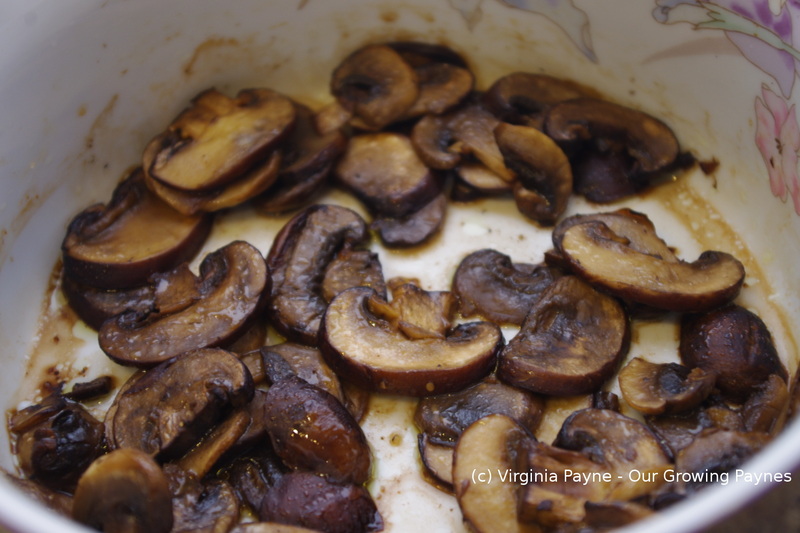 I find taking the step to roast the mushrooms really elevates the flavour of this soup. I made enough for two people with a little leftover for one lunch. 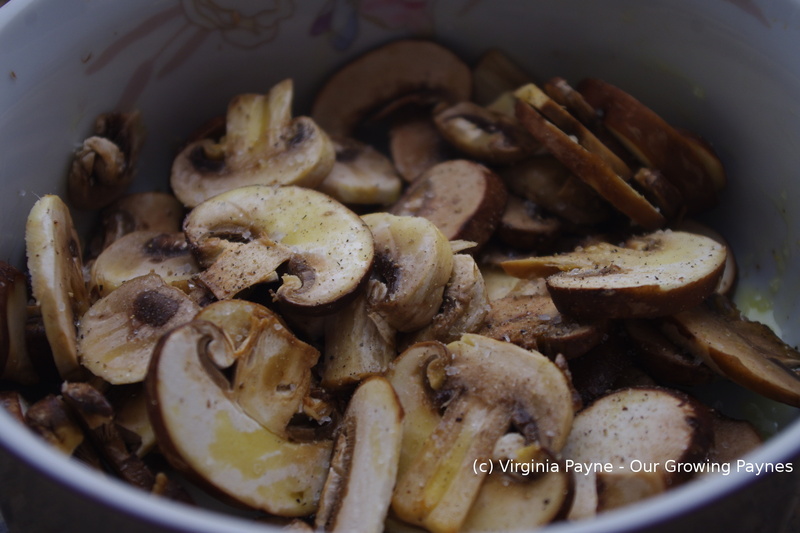 I sliced about 1 1/2 cups of mushrooms and tossed in olive oil with salt and pepper. Roast at 400F/200C for about 20 minutes stirring occasionally. In a sauce pan saute 1/2 a cup of chopped onions and a couple of chopped cloves of garlic for a few minutes. 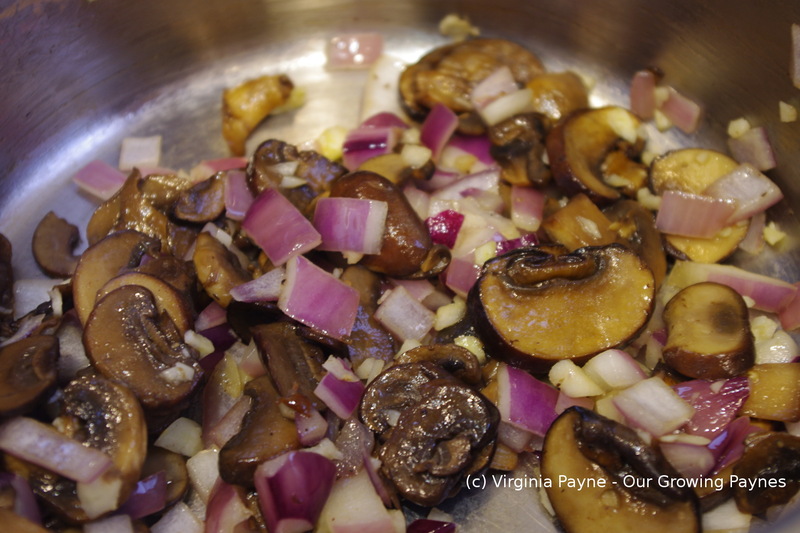 Add the mushrooms and saute for a few more minutes. Add 2 cups of veg bouillon and 1/2 a cup of marsala wine. Bring to a simmer and then add a few teaspoons of fresh chopped tarragon. When it is time to serve add about 3/4 cup of cream and heat through. Don’t let it boil! Just simmer until it’s hot. At this point add salt and pepper to taste. While you are doing this do up some cheesy toast with parmesan cheese. The pairing of the parmesan with the soup was very good. We both liked this a lot. It’s a shame our son doesn’t like mushrooms as I’d like to make this for the kids. Now on to a day of making cupcakes and gardening! It’s gorgeous out so enjoy the day! 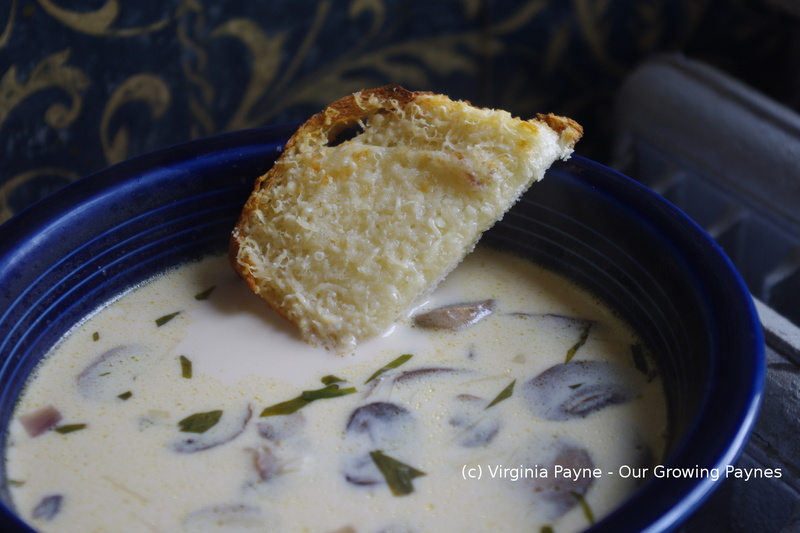 This entry was posted in French Recipes and tagged cooking, dinner, food, garlic, mushrooms, olive oil, Onions, roasted mushroom tarragon soup, roasted mushrooms, salt and pepper, soup, tarragon, vegetarian. Bookmark the permalink. With the weather improving though not yet stable, i think a mushroom soup like this would be perfect. Great idea, too, roasting the mushrooms first. That’s sure to add more flavor to the pot. Enjoy your time in the garden. That looks lovely. Great mushrooms are a meal in themselves. One of my absolute favourites is mushroom risotto ;- who needs meat? We rarely add meat to our risotto but always add the mushrooms. With sherry. Very tasty. Yum! It has been raining all week, so I’m still in comfort food mode. And ‘tarragon’ always just sounds so fancy. Doesn’t it? 🙂 It’s been cold and rainy here as well. I’m ready for warm weather to stick around.